Rarotonga, Aitutaki and New Zealand based players have been in contention for a spot to represent our country since July this year. 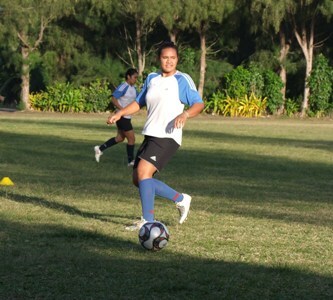 After recently traveling to Aitutaki to access the progress of the Aitutaki based players, National Women’s Coach Jimmy Katoa selected a final squad. “All the players worked hard during our training sessions, technically and physically to get to this stage, we are looking forward to the tournament in a few weeks time”, said Katoa. The OFC Nations Cup takes place in Auckland, New Zealand from 28th September to 8th October and Cook Islands will be joined by fellow member associations, Vanuatu, Tahiti, Tonga, Solomon Islands, Papua New Guinea, Fiji and host nation New Zealand. Cook Islands have been drawn in Group A and will meet Vanuatu, Tahiti and hosts and favorites New Zealand. The squad contains a blend of experienced and young players, with the new generation including a number of up-and-coming outstanding players who competed at the U-20 Women’s qualifying tournament earlier this year in New Zealand. The eight country teams will be playing for a place to represent their home country at the FIFA Women’s World Cup Germany 2011 and to improve their ranking within the region. Marjorie Toru (Avatiu), Maire Browne (Takuvaine), Jennifer Akavi (Nikao), Linade Unuka (Arorangi), Natasha Dean (Arorangi), Poko Manuela (Nikao), Tekura Kaukura (Aitutaki) Kim Tare (Aitutaki), Marissa Iroa (Tupapa), Vaine Henry (NZ), Elizabeth Harmon (Tupapa), Leiana Temata (Titikaveka), Ani Piri (Titikaveka), Apii Nicholls (NZ), Tekura Tutai (NZ), Dayna Napa (NZ), Regina Mustonen (Tupapa), Danielle Trego (Titikaveka), Louisa Manico (Avatiu) and Tepaeru Toka (Aitutaki). The team is coached by Jimmy Katoa and assisted by Michelle Paiti and Angela Wallbank, managed by John Taripo.